Philagrafika 2010 is an international festival that celebrates the role of print as a vital force in contemporary art, running from January 29 through April 11, 2010 throughout the city of Philadelphia. It is set to be one of the largest arts events in the United States, Philagrafika 2010 will showcase the work of more than 300 artists and will unite 88 Philadelphia area art institutions. 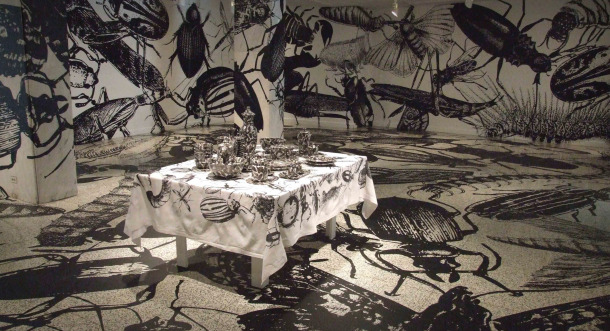 Curated by Artistic Director José Roca, Philagrafika 2010 will offer regional, national, and international audiences the opportunity to see contemporary art that references printmaking in dynamic, unexpected ways and to experience Philadelphia’s rich cultural life in the process. The festival was initiated by the Philagrafika organization, formerly known as the Philadelphia Print Collaborative. Philagrafika builds upon the region’s rich printmaking history and abundant artistic resources to enhance Philadelphia’s presence as an international center for innovative printmaking. Philagrafika 2010 is the result of more than five years of planning, culminating in a citywide collective effort, which appropriately reflects the collaborative nature of printmaking itself. In 2008, Roca formed a curatorial team whose members include: John Caperton, Sheryl Conkelton, Shelley Langdale, Lorie Mertes, and Julien Robson. Working with the curatorial team, Roca traveled across continents, visiting artist studios, print shops, biennials and other art events in search of artists to include in Philagrafika 2010. The festival is divided into three components: a core curated exhibition titled The Graphic Unconscious, Out of Print, and Independent Projects. The Graphic Unconscious: 35 artists from 18 countries displayed across 5 venues, curated by José Roca and the curatorial team; at Moore College of Art & Design, Pennsylvania Academy of the Fine Arts, Philadelphia Museum of Art, The Print Center, and Temple Gallery at Tyler School of Art, Temple University. Out of Print: 5 artists paired with 5 historic institutions; American Philosophical Society Museum, Historical Society of Pennsylvania, Independence Seaport Museum, Rosenbach Museum & Library, and University of Pennsylvania Museum of Archaeology and Anthropology. Independent Projects: Organized by 78 additional Philadelphia cultural institutions featuring a huge variety of monographic, group, and thematic exhibitions in which the printed image plays a central role. Philagrafika 2010 was initiated by the Philagrafika organization, formerly known as the Philadelphia Print Collaborative. Philagrafika builds upon the Philadelphia region’s rich printmaking history and abundant artistic resources to enhance the city’s presence as an international center for innovative printmaking. The organization was founded in 2000 by a group of arts professionals that recognized a growing convergence of artists, educators, curators, non-profit arts organizations, galleries, print workshops and museums that needed a central organizing body for cooperative initiatives that would exceed the capacity of any single organization. Is printmaking dead, or is it reborn? Is it a meaningful category at all anymore for contemporary artists who revel in mechanically produced imagery of all kinds and fearlessly use and misuse whatever tools are at hand? If you think these questions matter — and there are good reasons to think they do — you need to plan a trip to Philadelphia. With history as a backdrop, the city is abuzz with exhibitions, collective public works and visual happenings, organized in a gigantic print festival called Philagrafika. More than 300 artists at 80 venues are participating in this citywide celebration of the impact of printmaking concepts and methods on contemporary art. Philagrafika 2010’s main exhibition, “The Graphic Unconscious,” offers more dramatic examples of printmaking’s omnipresence in contemporary art. [Tromarama’s] film clip, like many of the works shown at “Philagrafika,” seeks to expand the definition of prints. It was made with a series of woodcuts used in traditional printmaking that have been “turned” at a rapid pace to animate the piece, which is set to a rock tune. The clip is much more entertaining than anything you might see on MTV, if it still showed videos.